On the list of Hidden Hideaways of Alaska's Roads Less Traveled, Nabesna Road is all too often overlooked by locals and passed over by visitors to the state. Alaska's Nabesna Road is a dynamite place to escape the crowds and still be able to camp in the luxury of your RV. So if you like taking a road less traveled, the Nabesna Road may be right for you. Driving the Nabesna Road offers an opportunity for just about everyone to explore inside of Wrangell-St. Elias National Park. 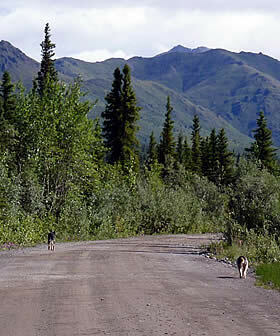 The road offers views of three mountain ranges; Wrangell, Mentasta, and Nutzotin Mountains. Nabesna Road is a great place to see wildlife too. Moose, bears, wolves and wolverines all live in this rather remote region of Alaska. Nabesna Road is largely unknown within the Alaska tourism market compared with how much publicity most National Parks receive. All along this gravel road there are turnouts where overnighting is possible with a few being called waysides that may have table and outhouses. Several campgrounds along the Nabesna Road offer rustic campsites although few are used outside of hunting season. The low volume of traffic along Nabesna Road is one of the reasons this is such a great find if you want to see wildlife and unspoiled scenery. This is not to say that there is not some sort of civilization along Nabesna Road. Located at milepost 29 you come across Sportsman's Paradise Lodge where a country bar complete with WiFi will make you feel that civilization has not been completely left behind. Be prepared as the road conditions on Nabesna road have a reputation of being tough on vehicles when you try to drive to fast. Let your first stop be the Slana Ranger Station at ½ mile up Nabesna Road. Slana Ranger Station has some interesting exhibits, a bookstore, information on ranger led programs, road info, Wrangell-St. Elias park & area information. This is the place to secure your backcountry trip planning, subsistence and ORV permits. Access to Nabesna Road is in the small town of Slana, Alaska. The road cuts off at mile 60 of the Glenn Highway, also known as The Tok Cutoff around Alaska. Nabesna Road covers 42 miles, plan on a good couple hours to drive either in or out thanks to all of the scenic pullouts along the road. Adequate areas are provided to turn around along the way and the end of the road too. While Nabesna Road is unpaved gravel it is pretty well maintained in the summers by the state. This is not to say that potholes and erosion are not commonplace. Just take your time and you'll be fine. This is a remote area with limited services. Private land adjoins many parts of the road. Please respect private property. Cell phone coverage? Not with most carriers we have tried. CAUTION! This road was built to access the Nabesna Gold Mine, which operated from 1925 - 1945. Limited, small scale mineral extraction has occurred since then. The Nabesna Mine and its structures are privately owned and situated on private property (located at the end of the road). Please respect this private property. Park visitors should avoid the Nabesna Mine area altogether. The mine tailings extend onto adjacent park lands and these tailings contain high levels of metals and are acidic. Surface waters in the area contain contaminants of potential concern including arsenic, cadmium, chromium, mercury, nickel, and lead. Environmental exposure may be hazardous. There is only one full service RV Park in this section of Wrangell Saint Elias National Park but there are a number of full service RV parks in the area to choose from. Hart D Ranch and Wrangell Roost Lodge are located on the northern boundary of the Wrangell-St. Elias National Park. Offers lodiging, RV park, tent camping, art gallery, post office and much more.